4/10 checked tower cam video - female in box incubating. 4/23 checked tower cam – female flushes – 5 eggs. 5/22 5 nestlings growing and doing well. 6/8 began photographing kestrels at tower entrance. 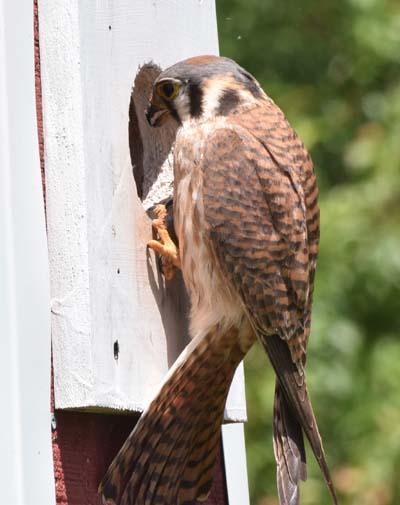 While the renewed success at both the barn and tower nests is reassuring, there is much evidence that kestrel populations in the Northeast and mid Atlantic are losing ground. Also, it has been reported that kestrel nests located along busy roadways or near noisy human activity are prone to desertion. 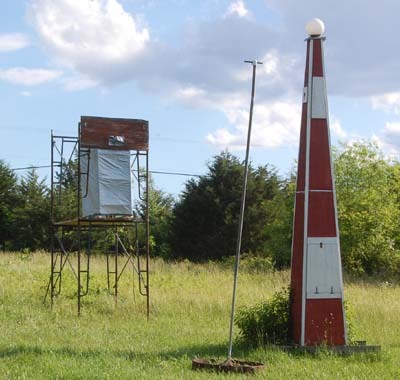 Our kestrel tower is 200 feet from a busy state highway and cedar trees along the road are now as high as the tower, blocking most of the truck noise. 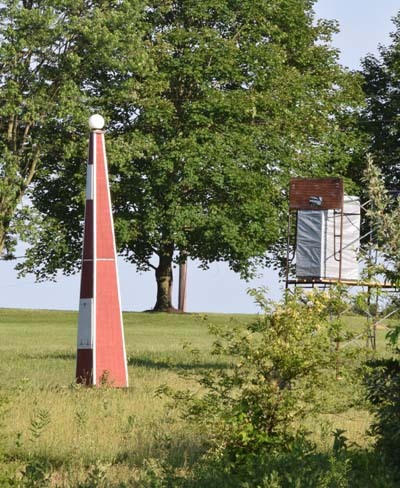 The cause of the 2014 nesting failures in both boxes and the 2015 tower desertion are still unknown, but, given their prior success, it is unlikely that location was a factor. 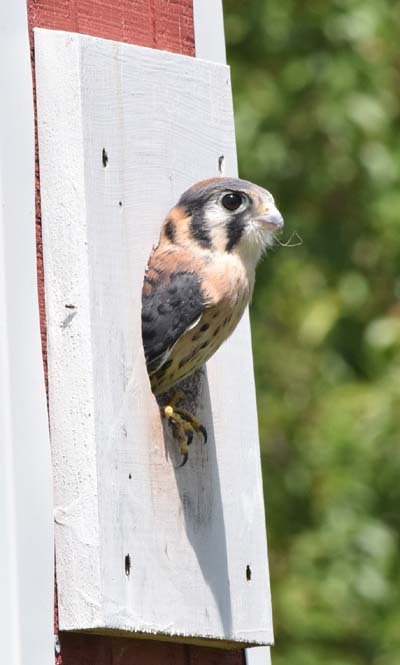 Many nest box trails are mounted on utility poles along highways as a matter of convenience and economy. And, of course, pesticides, especially rodenticides are always a concern when it comes to birds of prey. Kestrel population decline in much of northeastern North America, including the mid-Atlantic has become of concern to many, including myself. 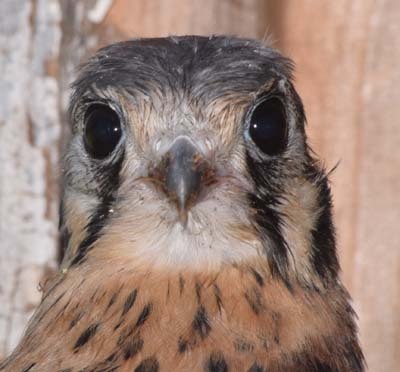 Below are a few links to recent kestrel study. Kestrels successfully raised a brood of 4 in box A on the barn wall. The nest box was monitored continuously with a small video camera and cap box with motion detection. All visits to the box were recorded in a daily log. As usual, flickers, starlings and kestrels made frequent visits to the box before the first kestrel egg was laid. A brief summary follows. Both male and female kestrels would briefly visit the box daily and starlings would frequently visit for longer periods. March 8 – A starling spends the night in the nest for the first time. This was repeated for the next two nights. March 11 – The female kestrel spends the night in the box for the first time. March 12 – The female kestrel leaves the box at 6:26 am. 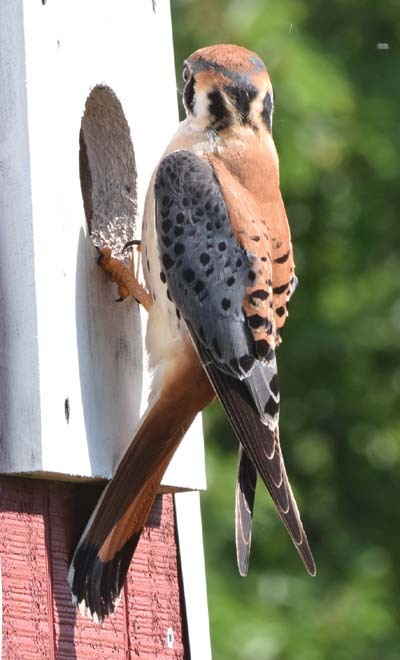 A male flicker enters the box for the first time. The female kestrel enters at 17:30 for the night. March 13 – Soon after the female kestrel leaves the box at 6:13am, a starling enters. The kestrel immediately returns and the starling leaves. This routine is now repeated almost daily. The kestrel routs the starling simply by entering the box – no contest. However, the starlings continue to frequently enter the box. March 21 – Starlings begin to build a nest. Kestrel not spending night in box, but still visiting daily, and occasionally finding and routing starlings. March 28 – I removed much starling nesting material. March 29 – Starlings rebuilding nest. I trapped one starling and removed nesting material and added fresh wood shavings. Starlings immediately begin rebuilding. Male flicker enters and begins removing starling nesting material. April 8 – Male flicker spends most of day in box, removing starling grass and tapping. April 10 – Male flicker returns and taps at entrance for one hour. Kestrels continue to visit daily. April 11 – Grey squirrel entered with one pup overnight. Observed at 5:28am. The infrared illumination is out on the camera. The squirrels left soon after I removed the box cap and took a flash photo. The next day she returned for three minutes, never to return again. I learned several weeks later that she had moved around the corner, into an inactivated starling trap, when I observed two pups peering at me from the trap entrance. April 12 – After squirrel visit, the flicker and kestrels make several longer visits, each appearing to think the box is theirs. April 15 – Only kestrel visits, mostly by female. April 16 – Kestrels rule from here on. Female makes longer visits, up to 72 minutes, then begins staying in box overnight. June 8 – Smallest nestling down and malnourished. Dead juvenile bat in nest – pecked at by nestlings, one of which unsuccessfully attempts to swallow it. The bat is continually pushed about and pecked at, to no avail. Late in the day the 5th nestling appears to be dead and two of the nestlings suddenly begin to peck at it just as they would with a prey item. The second largest nestling tears into the dead nestling methodically, first at the neck and then at the belly. The female kestrel enters with prey, feeds each of the 4 remaining nestlings and then leaves without touching the dead nestling or the bat. June 11 – The fourth chick is much smaller and less mature than the others, but quite active. He is the only male. All 4 seem to be doing fine. June 21 – The first three nestlings fledge, leaving the one male alone in the box. June 27 – The male fledges.